Ruger offers you an outstanding choice of compact, lightweight, autoloading rifles and carbines in both rifle and pistol calibers. 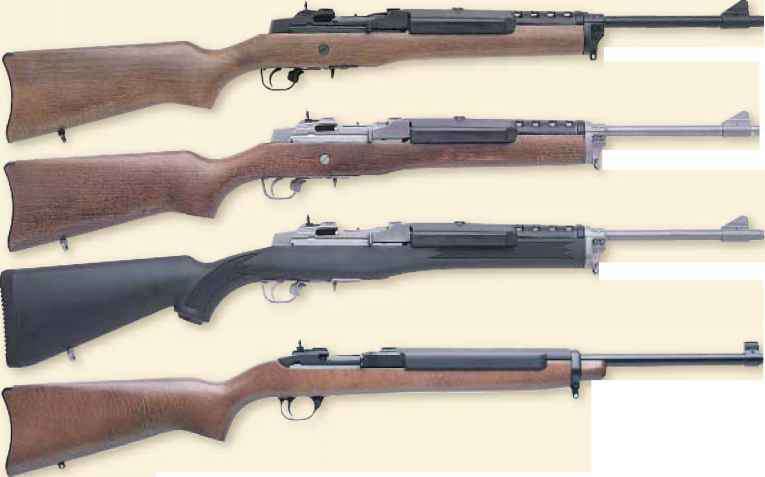 Each is Ruger-reliable and will serve you well for many hunting seasons. The Ruger Mini-14 rifle is chambered for the popular and proven 223 Rem. cartridge and has an adjustable rear sight. The Mini-14 employs a simple, rugged version of the Garand breechbolt locking system, with a fixed-piston gas system and self-cleaning moving gas cylinder. Since its introduction in 1974, the Mini-14 has proven itself many times over, in farm and ranch use, and in law enforcement and security applications. In 1982, Ruger introduced the Ruger Ranch Rifle, an updated Mini-14 with integral scope bases, a patented recoil buffer system, and side ejection to clear a low-mounted scope sight. The Ruger Mini Thirty made its debut in 1986. Chambered for the widely accepted 7.62 x 39mm cartridge, the Mini Thirty has proven itself an ideal autoloader for deer-size game at medium ranges. Chambered in 44 Magnum, the Ruger Deerfield Carbine is the result of over 40 years of continuous improvement. The Deerfield Carbine employs a patented, flush mounted, 4-round detachable rotary magazine, perfectly adapted to rimmed cartridges. The Deerfield is powerful, light, handy, and lives up to Ruger's reputation for reliable service in the field. It's the perfect deer rifle for the 21st century. Deerfield Carbine, Ranch Rifle and Mini Thirty feature integral scope bases and include 1" Ruger medium-height scope rings at no extra cost, a $60.00 value.